Comparing Bluehost and Squarespace is the same as comparing oranges to apples. Both serve the same purpose of building websites of different types to an end though with a bit different approach. Each platform comes with a bunch of features and instruments to meet various website needs. Our mission is to define all weak and strong issues to highlight the best option to start a website. Bluehost is the most recognizable hosting provider that powers more than 5 million sites worldwide. At the same time, it is not just a hosting company. A WordPress recommended platform is a nice pick for all WP-powered website fans with tons of plugins, add-ons, widgets, and other customization tools. In this review, we will consider it as the WP-based site + hosting package. Squarespace – is a popular website builder designed mainly for non-technicians. It claims to be a decent tool when it comes to creating websites of any type from scratch. It can be a good builder and hosting for blogs, eCommerce sites, portfolios, etc. Although it was initially created as a simple drag-and-drop editor, it appeared to be a complex tool even for beginners. Let’s have a detailed look at all features delivered by two different platforms to see, which one takes the win. Note: we have made this research from the website building point of view. 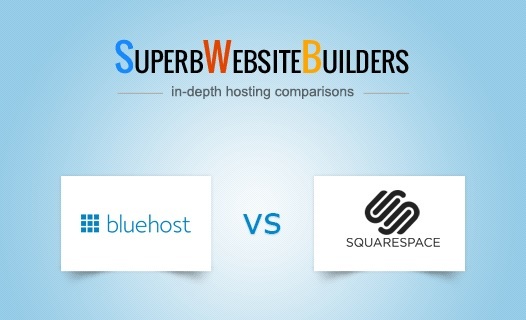 Comparing Squarespace vs Bluehost as a hosting service is illogical. Bluehost. 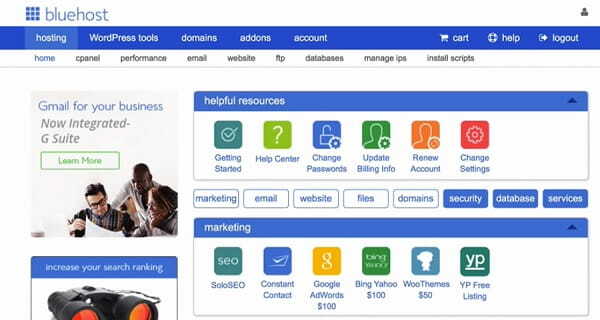 Bluehost is an easy-to-use platform with its own intuitive cPanel. Here you have all necessary instruments in one place including WP marketplace, domain management tools, advanced settings, end more. Once you have logged in, simply enter the website name and tagline to start building a new project. Widgets, Shortcodes, categories, archives, etc. The latest update made WordPress much easier to use whenever your pages require additional customization. 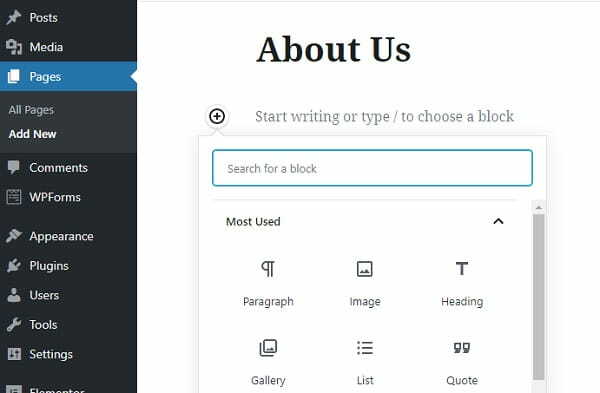 A Simple Editor – users can add different blocks and manage content with ease thanks to the WYSIWYG editing tool. However, every time you change the page or section, it will be automatically saved. There is no preview mode to see how the future website will look like before publishing. Drag-and-Drop Feature – although the platform now claims to be a 100% drag-and-drop tool, users will be surprised to know that nothing will happen when they hover the mouse with the image of video over the template. You need to access Style editor first and then upload files you want to add. Style Editor – it is the heart of the platform letting users move different blocks, upload media content, resize elements and more. In spite of all claims to be a perfect website builder for newbies, it will take them some time to figure out how the system works. Bluehost vs Squarespace. Although Bluehost is not a drag-and-drop website builder, it looks easier to use in terms of a WP-based editor even when compared to Squarespace WYSIWYG editing panel. Endless WP themes to choose from – thousands of themes are available within a Bluehost package. Premium Apps and Tools – the marketplace delivers hundreds of applications and add-ons out of the box. Professional Services – a pool of professionals is here to help you with website optimization or customization. Services – Bluehost experts will land you a hand whenever you need to install plugins or services to your dashboard. They will help you with payment service integration, Google Analytics installation, contact form deployment, etc. Also, keep in mind automatic plugin and theme updates. Bluehost managed to create an automated WP-based website building service with all the necessary instruments in one place. See also: How to create a website with WordPress. Squarespace. Squarespace has also proved to be a flexible enough platform. It fairly delivers a number of good website building tools and capabilities. You can choose from add-ons and in-built integrations to make the website a bit more functional and unique. Add-ons and Apps – Squarespace makes it easy to customize your pages. You can implement widgets to create catchy galleries, adjust social buttons, create custom contact forms, integrate analytic and stat monitoring tools, etc. Blogging – a great feature for dedicated bloggers. The platform lets you not just create a solid blog with comments, trackbacks, RSS feed and reclogging, but also publish your own podcasts, enable GEO or iTunes tagging, and more. eCommerce – a ready-to-use Squarespace feature for small digital stores. It is available with all platform’s plans with some slight differences depending on the price. The function makes it easy to integrate shopping cart feature, add and manage products as well as their SKUs, integrate payment options, launch promotion and loyalty programs, etc. SEO – You should not expect much from this particular feature especially if compared to WordPress SEO capabilities. You will get some basic tools to edit the title and description making them a bit more SEO friendly. Although Squarespace might look like a flexible platform, it has some crucial drawbacks like the lack of its own App Store. Bluehost vs Squarespace. Bluehost boasts better flexibility of compared to Squarespace. It has its own marketplace with thousands of WP themes, plugins and add-ons that are easy to integrate. Bluehost. 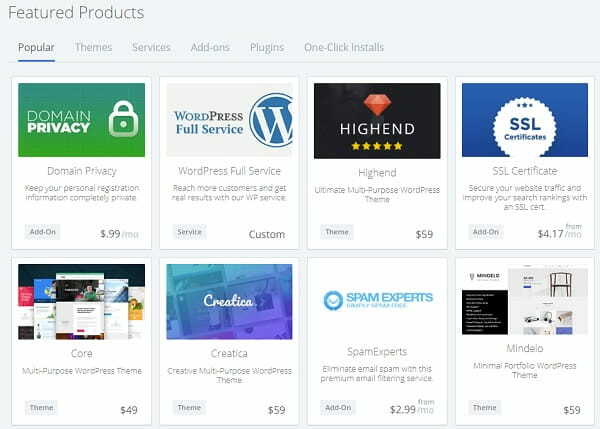 Bluehost brings an endless array of WordPress themes. They include both free and paid templates for websites of any type whether you plan to launch a small digital shop, professional blog, small business website or anything else. The quality of each template might differ. On the other hand, you can navigate and preview themes before opting for any of them. As a rule, all themes are mobile-responsive. They run equally well on different types of mobile devices (tablets, smartphones). All you need is to choose a category or topic that refers to your future site specialization and browse through all available options. Good news is that you might need some basic HTML/CSS knowledge to customize your theme whatever you need to create a website with a unique design. Bluehost reserves endless customization opportunities for those who have some programming experience. You are free to resize website blocks and elements, change typography, color background, etc. Themes for Digital Shops and Café/Restaurant Sites. All templates look pretty well. They feature a professional design through most of them look alike. Bluehost vs Squarespace. Bluehost is certainly a better option in terms of design. It delivers a wider array of different themes, while both platforms offer CSS and HTML access to customize the pages and implement any web design idea. Bluehost. Bluehost offers several ways to get in touch with the support team. Apart from basic channels such as Live Chat, ticketing or phone, users will appreciate a separate WordPress support team. A team of experts is always ready to help with any WP-related issue. Additional support comes in form of tutorials, how-to-guides, articles, etc. Moreover, you can use Bluehost services to get assistance with website customization, tools’ integration, optimization, etc. Squarespace. Squarespace support team is available via Live Chat that claims to be available round the clock. You can keep in touch via email ticketing system as well. The platform has its own knowledge base including video tutorials, articles, and local Community Forum. Squarespace vs Bluehost. Although Squarespace users will never suffer from the lack of attention from support specialties, Bluehost establishes a more diverse and flexible approach to its customer care. Apart from baseline options, users will appreciate professional WordPress assistance and additional services that refer to integration, website settings, etc. Bluehost users can benefit from an extended list of web capabilities delivered by Cloud, VPS or Dedicated Hosting services for more complicated projects. Personal Plan costing $12 per month with a free domain and up to 20 pages. Good for portfolios and blogs. Business Plan costing $18 per month with unlimited pages and AdWords Credit. Good for small digital stores. Basic Online Store costing $26 per month with unlimited products, storage and bandwidth for a solid eCommerce project. Advanced Online Store costing $40 per month with label printing, real-time carrier shipping. Good for advanced eCommerce projects that look for expenditure. Bluehost vs Squarespace. Bluehost is obviously a cheaper web building solution with much more features to benefit from. From this point of view, Squarespace looks like a more limited platform. It is obvious that Bluehost and Squarespace are totally different platforms. On the other hand, they have one crucial thing in common. They are both designed to help people build solid websites. From this point of view, Bluehost looks like a more flexible and cost-effective solution. Bluehost brings everything you might need to build a website at a reasonable price. Apart from various hosting solutions, users will benefit from a simple editing panel as well as custom WordPress dashboard. The platform delivers a range of add-ons, widgets and apps to build a professional WP-based website from scratch with ease at low cost. Squarespace is still a website builder, which means less flexibility in terms of web building and customization. On the one hand, it can be a good option for newbies to get started considering its drag-and-drop nature. On the other hand, you will realize you require a bit more than that after some time especially at that price. As a result, we have Bluehost as an easy-to-use platform with 100% WordPress support and integration. From now, WP-based websites no longer depend on web hosting price and separate places to store your site. Bluehost comes as an all-in-one solution to create any project forms scratch having a website and hosting in one place.